We are pleased to announce that Waterloo Region Minor Football (formerly Twin Cities Minor Football) after an absence of 8 years will be returning as members of the Ontario Varsity Football League (OVFL) for the 2017 season. As we mentioned in our town hall meeting , we have been investigating our options to ensure our players continue to compete at the highest level of football in Ontario and we believe undoubtedly that the OVFL , a well-seasoned league in it’s 20th year of operation is the best home for our association. Our Bantam, Junior Varsity and Senior Varsity teams will be competing against some of Ontario’s most successful and strongest franchises, many with OVFL championships under their belt, such as Ottawa Myers, Scarborough Thunder, Etobicoke Eagles, Brampton Bulldogs, and Metro Toronto Wildcats to name a few. We have been members of the OFC since their inaugural 2008 season and would like to thank them for their support and appreciate their efforts in running a well organized, competitive league. 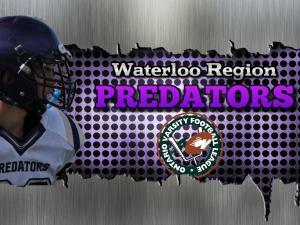 We will continue as members of the OFC, with our Peewee Predators competing there for the 2017 season and hope to work closely and cooperatively with all leagues as we do our part to grow football in Ontario. The OVFL is stronger than its ever been. Newly elected league commissioner Ed Sousa leads the way for a proud group of experienced franchises with a pedigree of success that is exceeded no where else. The Commish has franchises that are as pleased to represent their own regions as they are to work with each other as the league prepares its 20th year. He also knows that the streamlined OVFL of 2017 will offer the highest calibre tackle football ,unrivalled in any other league in Ontario. And ahead? 20 more years of unmatched experience, stability and success in Southern Ontario rep Football. The OVFL is upgrading it’s website for 2017 , that will not only show game scores and standings but every player will have a personal profile with picture and individual game stats! Definitely an exciting added bonus for our hard working players. The OVFL is currently working on the game schedule and should have it ready for release in the next couple of weeks. We expect our travel for away games to be mostly to the GTA. Why Move to the OVFL? Waterloo Region Football is a tier 1 association , with a mandate to ensure our rep players are challenged each week to top level competition. The OVFL has the experience and substance no other league can currently offer, with member centres who have a long history of competitive success. THE OVFL management are independents, meaning that the league commissioner Ed Sousa and President Marie Jackson are not affiliated with any football association. This transparency prevents unavoidable consequences such as conflict of interest that being a president and member of the same league can bring. How Does the OVFL Compare to the OPFL? When you compare the Win/Loss numbers of new league teams and OVFL teams, statistically it's a dead heat. Almost exactly the same number of wins and losses when playing against the same competition. Almost exactly the same number of OVFL championships. It's impossible to declare either league the "premier" league, but what is certain is that the level of competition in the OVFL will be every bit as strong as the OPFL, and when you factor in the 20 years of history and stability, the OVFL is the best choice for Waterloo Region Football. With our Bantam, JV & SV coaches all UW Warriors Alumni and coaching staffs loaded with CIS/OUA coaching/playing experience, our player development will be second to none. Couple that with top level competition and our players are guaranteed to be challenged! Oh and if your goal is to play at the next level, we have recruitment support to assist you every step of the way! We are truly excited about the upcoming 2017 season and can’t wait to get started! Stay tuned for information on dates and times for tryouts.